Carpet beetles are a very common pest around San Diego county and they can be found in many homes and businesses. 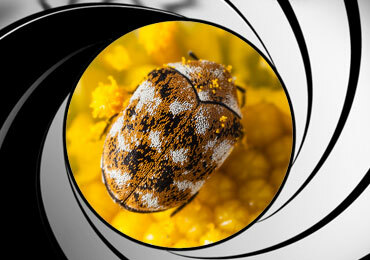 Our inspectors usually find black carpet beetles, varied carpet beetles or furniture beetles. Carpet beetles enter your home through doors, windows, in furniture and clothing. The carpet beetle will feed on common items in your home including carpets, draperies, furniture, clothing, pet or human hair, antiques and various other natural products. Once the carpet beetle enters the home, the female will lay between 50-80 eggs near a food source. As they eggs hatch, the carpet beetle larva will feed on nearby materials. Nearly all carpet beetle damage is from the larval stage. A complete inspection of the interior of the home is the first step in controlling carpet beetles. Depending on the level of infestation, carpet beetles can be very difficult to gain control over. Our technicians are required to be diligent in the inspection process as finding the source of the infestation is the only way to eradicate these pests. We’ve found carpet beetles in beds, stuffed animals, feeding on other dead insects in wall voids, old toys, felt hats and even in attics! To kill carpet beetles in clothing, we recommend laundering with high heat - about 120 degrees. When License-To-Kill performs your service, the closets should be accessible for treatment. We also treat all of the cracks and crevices around windows and doors, baseboards, as well as any carpeting, furniture and draperies. It is important to note that prior to treatment, we ask that your carpets be thoroughly vacuumed. Get Rid Of Your Carpet Beetles Today!